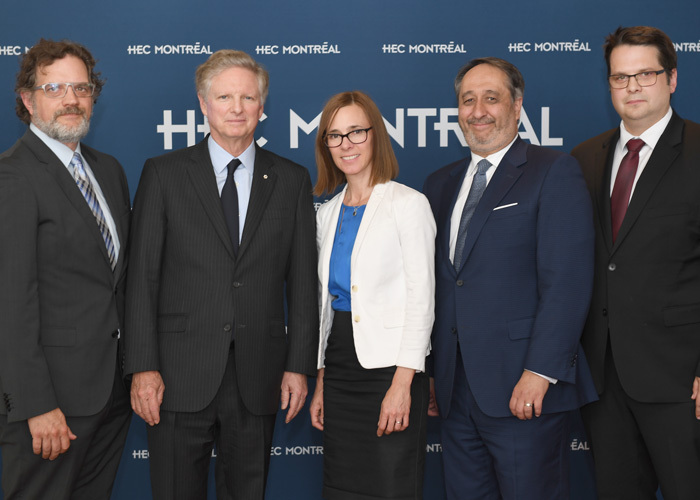 Professors Martin Boyer and Pierre-Carl Michaud, flanking Paul Desmarais Jr from Power Corporation, Mélanie Gagnon from the HEC Montréal Foundation and Michel Patry, Director of HEC Montréal. The Retirement and Savings Institute (RSI) thanked its main financial partner, Power Corporation of Canada, at a recognition event held on May 30 at the School. This was also an opportunity to report on the Institute’s activities and projects, now that it has truly taken off. Created in 2017 thanks to a major donation from Power Corporation of Canada, the Institute aims to promote cutting-edge research so as to better understand issues related to individuals’ retirement, savings and insurance. The Institute encourages research in these areas by supporting the work of the two Chairs at the heart of its ecosystem: the Industrial Alliance Research Chair on the Economics of Demographic Change and the Power Corporation of Canada Research Chair in Insurance and Pension Plans, created in October 2017. Other research chairs will likely be added in years to come. The team of researchers at the Institute is headed up by Professor Pierre-Carl Michaud and to date consists of Professors Martin Boyer, holder of the Power Corporation of Canada Research Chair, Philippe d’Astous and Bernard Morency. This team, assisted by professors and fellows from other universities, has expanded in recent months with the addition of two research associates and is to continue growing, since it is expected that other researchers will be recruited. The RSI will continue to welcome visiting researchers specializing in savings and retirement issues. In 2017-2018, a dozen researchers came to the Institute to present their work or develop collaborative initiatives. The same number of visiting researchers is expected next year. In this first year, two surveys were carried out using web panels. One focused on certain decumulation products, while the other looked at TFSAs and RRSPs. Other web surveys are to be conducted, for instance on financial literacy regarding retirement and on financial advisory services. The Institute has also been helping to develop future researchers, granting the Henri-Paul Rousseau Scholarship to two PhD students whose thesis work deals with retirement and savings. One of the Institute’s important projects is to analyze big data on individuals’ savings habits, in partnership with financial service providers. Access to this data will be a valuable tool for the Institute, to better understand market structures and consumer behaviour.